For those not yet aware, “Falafel” is a common dish eaten throughout the Middle East and are Egyptian in origin. They are delectable little deep-fried balls or patties made from ground chickpeas, fava beans, or both. Falafel is usually served in a pita, which acts as a pocket, or wrapped in a flatbread known as lafa; “falafel.” Falafel are typically topped with salads, pickled vegetables, hot sauce, and drizzled with tahini-based sauces. Falafel balls may also be eaten alone as a snack or served as part of a meze (appetizers).These scrumptious bean-based fritters are now found around the world as a replacement for meat and as a form of street food. I’ve made many versions, but this is my favorite recipe that provides consistent perfect results every time. If you are a fan of cilantro feel free to divide the parsley in half and substitute with cilantro instead. The results will be the same, but impart the earthy, lemony flavor of cilantro. You can also roll in sesame seeds before frying for added flavor and aesthetics as well. Toppings: shredded cabbage, chopped tomato, sliced pickled beets, sliced dill pickles, hummus & lemon yogurt dipping sauce, recipe follows. 1/2 teaspoon ground cumin and kosher salt, as needed. Mix ingredients well and chill in frig until ready to use. Makes 1 ½ cups. In medium skillet over medium heat, add 2 tablespoons oil and sauté onion and peppers 2 to 3 minutes, add garlic and cook until translucent, about 5 minutes. In a food processor, pulse chick peas, olives, red chili flakes, ground cumin, egg and salt and black pepper to taste. Form a coarse consistency. Add flour and parsley. Pulse until mixture starts pulling from the sides of the food processor. Remove mixture to a large bowl and mix in the onion mixture. Chill falafel until ready to cook. In a thick-bottomed skillet heat 1/2 inch of canola oil over medium heat to 350 degrees. 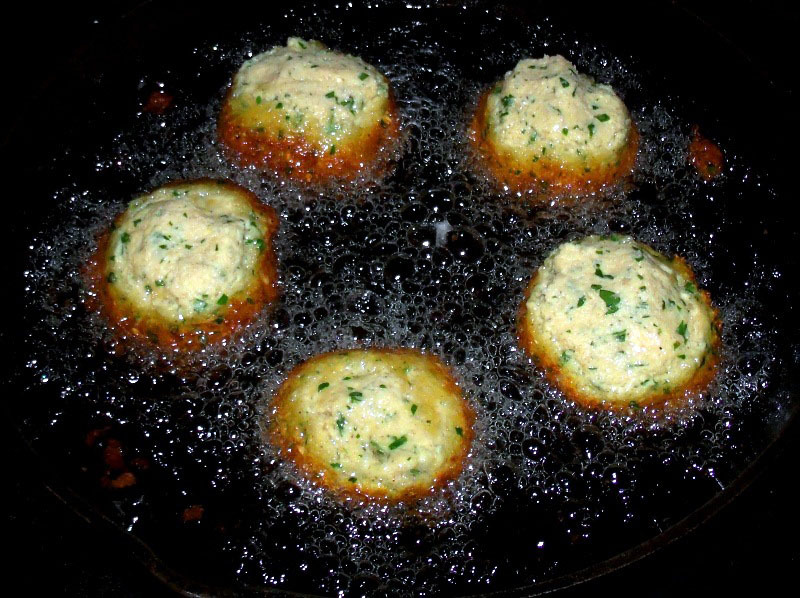 Use a small cookie scoop to form into small balls and drop into hot oil—slightly flatten tops. Cook falafel balls a few at a time, until golden brown, about 5 minutes; turning so not to burn or stick to the bottom of the pan. Drain on paper towels and sprinkle with salt while still hot. Open the pita bread to make pockets. 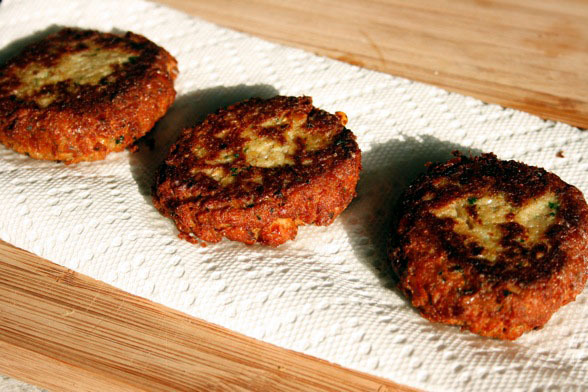 Smear a about 1 tablespoon of hummus inside, place in 3 to 4 falafels. 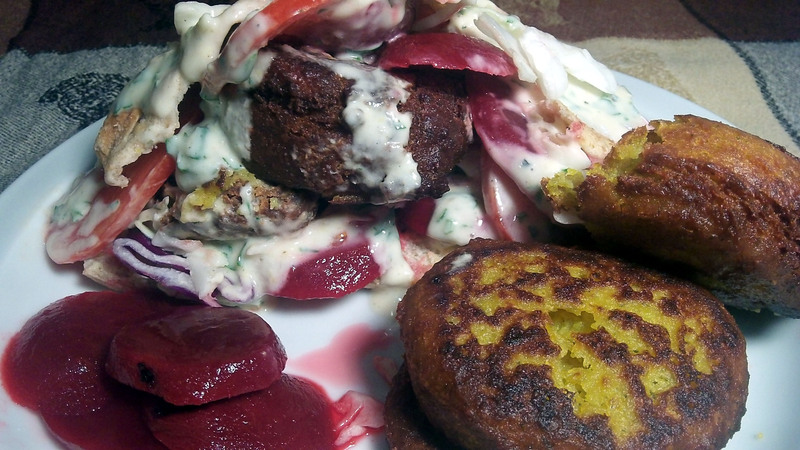 Stuff with cabbage, tomato, pickled beets and pickles; drizzle with sauce generously on the inside. Previous Post I Want One! 2014’s Top Rated Kitchen Gadgets #5 UberChef’s Dual Julienne & Vegetable Peeler. Top Notch! Next Post Copy That! Taco Bell’s Pizza! Famous Copy Cat Clone Recipes Simply Delicioso! Oh Thank You, Lynz!! You’re right, there are so many variations! I can’t express enough how much I appreciate & value your opinion! My hubby used to frequent a little falafel shoppe in CA when he lived there. He always mentions that they had the BEST around and raves about a basic, non lemony white sauce that made them amazing. I’ve been trying to replicate it for years to no avail. Any suggestions? Thank you, my friend! Yes I am sure! I can only tell you how I learned it which is basic. i dont measure so estimate, yogurt, 1 spoon tahini, 2 garlic, juice of one lemon, salt. This is my way so everyone is different. Please tell me if you try it. Thanks Again, Lynz!! This will be my next white for falafel! I SO appreciate your input..Very valuable!! Sure I hope you like it, I use it for foul which I will put up and many other things, just a really basic one.